This event is co-organised by the European Aquaculture Society (EAS) and the World Aquaculture Society (WAS). It will highlight the latest aquaculture research and innovation to underpin continued growth of this exciting food production sector. 2500+ participants (researchers, educators, producers, investors, suppliers, engineering consulting firms..) from 60+ countries are awaited. Scientists' coming from the whole world, constitutes for the French research community an opportunity unique to promote its researches and establish/strengthen new networks of collaboration. 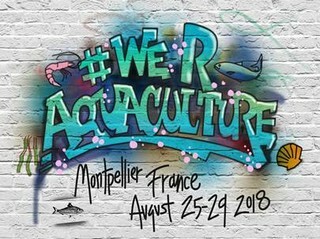 The coming of the main industrial actors of all aquaculture sectors (fish, shellfish, algae..) will allow the French sector to be at the heart of the innovation in their sector and will constitute an opportunity unique to promote their activity and their international development. The Research institutes of the Region mobilized: In addition to a dozen universities spread all around France, four main organizations lead national aquaculture research in fish and shellfish, all of which are present in the Occitanie Region: Ifremer, INRA, CIRAD, IRD. These four bodies collaborate actively and mutualize a part of their infrastructures on the Ifremer site of Palavas-les-Flots (a small coastal city next to Montpellier), the largest research infrastructure dedicated to mariculture in France. With a research community of such a scale, Montpellier offers the main French expertise of aquaculture research in the disciplines of genetics, physiology, ecology, and system engineering for: - all Mediterranean and tropical species: fish, mollusks, shrimps, algae - reared in all the types of environment: sea, brackish and fresh waters - in all the types of systems: intensive, extensive, recirculated, integrated multi-trophic It offers to the EAS/WAS 2018 coming, the possibility of counting on its reputation internationally recognized in the field of aquaculture, in particular thanks to a local committee constituted of researchers of international fame, which supports the scientific organization of the congress, organizes the technical visit of research centers and facilitates the dialogue with local institutions.